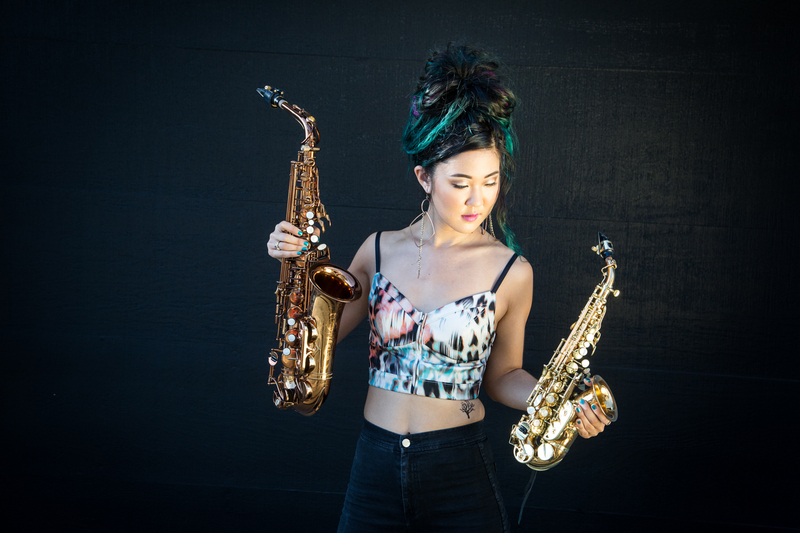 At only 25-years-old, Korean American jazz musician, singer, songwriter, composer and renowned saxophone player Grace Kelly is already more than 10 years into her career. A prolific artist who is on the rise and redefining what jazz music can be for this generation, Kelly has 10 albums under her belt, the first having released when she was 12 years old. Her latest, Trying to Figure It Out, came out last year. Growing up in Brookline, Massachusetts, Kelly’s knack for the arts started early. She started classical piano at the age of 6, but realized she hated practicing. It was in fourth grade that she found the saxophone — and fell in love with its sound, especially thanks to her parents’ love of legendary jazz saxophonist Stan Getz. The spunky blue-haired musician had unique teenage years. After recording her first album, Kelly traveled to Norway to play her first international concert at the age of 13, only then to come back as an eighth-grader. Three years later, she enrolled in the Berklee College of Music and graduated at 19. As a seven-time Downbeat Critics Poll “Rising Star,” known for her innovative approach toward blending pop, soul, rock and Broadway into jazz, she’s gone on to perform as a regular on Late Show With Stephen Colbert with the house band Stay Human, led by musical director Jon Batiste; headlined more than 700 shows in over 30 countries; and is a go-to artist for jazz festivals around the globe. Kelly, who is based in New York City, spoke with me about her busy musical lifestyle, work ethic and various upcoming musical projects. Tell me a little bit about your background and picking up the saxophone and jazz music in general. How did that all start? My mom has always really been into the live arts and played a ton of music. Ever since I could remember, it was always music that was on instead of television. She told me that ever since I could talk I was singing. My parents played a lot of different music, everything from Broadway to classical music, pop music and jazz. This saxophonist Stan Getz would be the only saxophonist that my mom would play and I just fell in love with the sound of a saxophone. In the back of my head, I always knew that one day I would play the saxophone. I’ve been singing and been playing classical piano since the age of 6 and quickly found out that I hated practicing, so they signed me up for a jazz teacher, and I started writing my own songs when I was 7 years old. It just became this very organic journey of music. I never knew it was going to be a professional thing but it’s a big passion in my life and I’m very grateful to have it be something I can do professionally. How do you feel about being a Korean American in this industry? Has that affected you at all growing up? 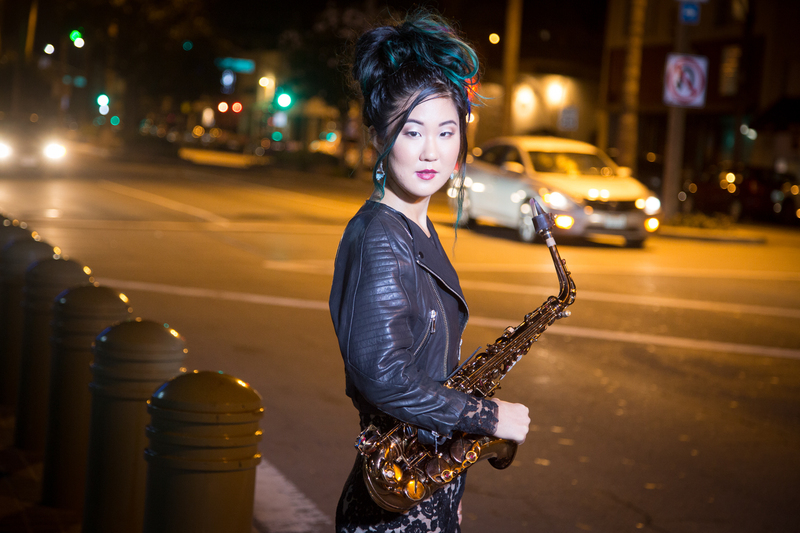 There’s not a lot of Korean American musicians, especially people who learn jazz and are in that world. When I was younger, it’s not something that I thought about but as I got older and am getting more and more messages from young Korean girls or their parents saying you’re a huge role model, you’re an inspiration … I’m starting to realize it’s an incredible responsibility and honor to get to be these girls’ role model. I’ve been very lucky in my career that the mentors that have taken me on have been very welcoming. This music is so much, ‘Do you have talent? Can you play?’ I’ve never gotten discriminated for my race. I love playing saxophone and being loud and bold and colorful and different and out-of-the-box. I hope to be even more of a spokesperson for Korean Americans and Asian American girls. I think it’s something we need more of. I saw on your segment on the Asian American Life and you mentioned you’re doing a pop-up series filming in different places. Tell me a little bit about that and where the inspiration behind that came from. One of my goals for 2017 was to get a lot more content out there. I think the interesting thing about the way technology is moving so fast and how it’s affecting the arts is basically, where the old model of going in a shell and working on an album for a full year and then coming out with an album for a few months and then going back into silence for a year, I think that’s such an old model … So I thought, there’s gotta be a way to get more content out there to have it spread on the Internet. Sometimes jazz people can be old-fashioned about the way they do their promotion, so I thought how cool would it be to take my saxophone to all these awesome places that I’m traveling and do one-minute clips of me playing in very unusual settings! You’re bringing such a new market — jazz music — to a different generation, which I think is awesome. That’s been the cool thing about watching these videos of people who have never seen my music or aren’t jazz fans. They’d see the clips and share them … At the end of the day, my tradition and roots are jazz. I think there’s so much beauty to the art form of the idea of improvisation. That could lend itself to anything. What can we look forward to from Grace Kelly? I have an electronic project called GKC Union, which is pop music meets horns. I’m also gearing up for my next album under my jazz name, Grace Kelly, which is going to be a big band album. What is one piece of advice you have for other artists? Follow that inner calling and that passion. It can certainly be tough. I think people fall into doing this thing for their families, for their dad or mom and end up extremely unhappy. What’s going to make you happy when you go to bed at night, wake up in the morning, make you want to work at this thing you love or this career you love for yourself, not for the outside accolades or your parents? I think that’s what it comes down to because I know for me, music is this incredible grind and hustle. There are ups and downs, there are slow times and there are busy times. At the end of the day I love doing it so much because I couldn’t imagine doing anything else that gives me the energy and passion to persevere through all of that stuff. My parents have always said to me and my sister, “Find something that you’re extremely passionate about doing so you never feel like you work a day in your life.” I think if the whole family is more open to being able to let their kids find their passion, I think that’s very powerful. Follow Grace on social media via her Facebook, Instagram and Twitter.